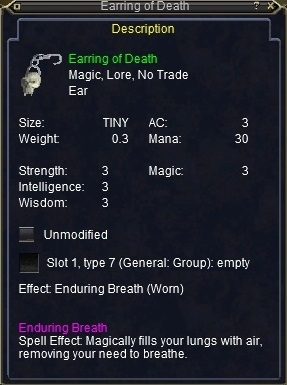 Sadly, this item drops off of "A Possessed Warlord" in the Ring of Fire. I have the program is there a simple way to export your items into your profile? yes; purchase Magelo Premiuum for $12 per year for automatic syncronization. God i have too many alts! My Bst has Forest Loops, if i can get my paws on a pair of these earings i would buy/trade them in a min! They really should have made the effect; Breath of the Dead, the necro version of EB... would make a bit more sense name wise. Yah. I was expecting permanent DMF. I geuss that would be kinda too much though. Permanent DMF = permanent levitate and VI will never introduce such items. Some zones like Sirens Grotto or the Plane of Air remove all levitate effect when you zone in (PoA even strip all your buffs :p) and I bet it would be too difficult for them to cancel only one part of a spell or a permanent effect :). Instead of a permanent DMF, I would better imagine a trigered DMF, but I guess it will be overpowered by "the vision" :p.
Actually there is a permanent Levi item out there, rare drop part of Mage epic: Pegasus cloak.